Why do I need a loopback cable? Sometimes in order to test a computer’s hardware or software we need a network link for the network adapter. The solution, very often, is to carry around a hub. A loopback software adapter sometimes could help but in many cases it doesn’t work. The best solution is to create a loopback cable. 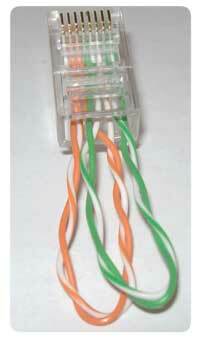 The loopback cable, or loopback addapter, will work as the computer, or router, or other networked device, was connected to a real network transmitting and receiving packets. The packets are sent and received in a loop, this kind of setup allowing the technician to troubleshoot hardware. What is a loopback cable? A loopback cable redirects the output back into itself. This effectively gives the NIC the impression that it is communicating on a network, since its able to transmit and receive communications. Redirect Pin 1 to Pin 3 and Pin 2 to Pin 6. 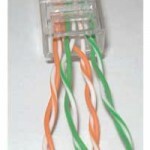 Take a CAT3 or CAT5 UTP cable and strip the jacket trying to preserve the jacket intact, as you will need it later. 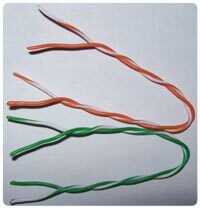 Maintain the wire twists as this will prevent electromagnetic interferences between the two pairs. 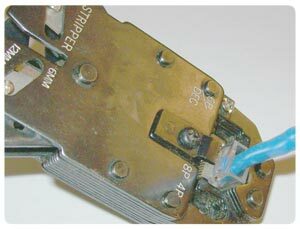 Untwist the least possible so you could insert the wires into the RJ45 plug. 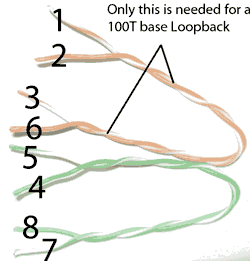 For a 100T base loopback you only need two pairs, I choose orange and green pairs. Bend the orange pair at the middle making a U shape. White-Orange wire into the pin number 1 and pin number 3 and the solid Orange wire into pin number 2 and pin number 6. Try do insert the four ends at the same time as this is easier. At this point you can crimp your plug for a 100T base loopback cable. 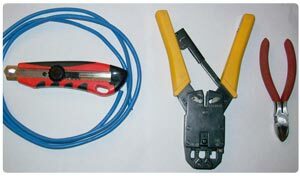 Make sure you insert the cable jacket before crimping. The jacket has to be inserted into the plug about an inch so that it’s crimped in and offers rigidity to the loopback cable. If you want your loopback cable to work at 1Gb you need to insert the second pair, (green), insert the cable jacket and only crimp after that. The green pair is inserted as follows: solid-Green wire in the pin 4 and pin 7 and white-green into 5 and 8. Improve this article by commenting and asking questions.